I’m adding a new quote to my long list of Quotes I Love. This one came from Naomi Osaka‘s post US Open victory press conference in Japan. Here is the quote with video linked below. Naomi Osaka on her U.S. Open victory – Press Conference in Japan – First-time Grand Slam winner Naomi Osaka returns to Japan and speaks out after her U.S. Open final win. Earlier in 2017, my Facebook friend Horatio Tsoi (蔡錦源 Kam Yuen), an experienced TV/film director & producer, and his Hong Kong team completed a stunningly/hauntingly beautiful/insightful independent documentary 《311 – Revival 》 that is also thought provoking. We get to see different parts of Fukushima Prefecture up close through the eyes of the presenter Clarisse Yeung 楊雪盈 (a HK district council politician), the film crews, and the high flying drone camera that shot some hauntingly beautiful footage. We also get to hear from local residents, a farmer, restaurant operators, NGO volunteer radiation measuring group, TEPCO (Tokyo Electric Power Company ran the destroyed nuclear plants) official interviewed for the film to get their perspectives on things. Many parts of this film touched me deeply. Have a read of an insightful Asahi Weekly interview with award-winning doc filmmaker Kazuhiro Soda about “Peace” where he talked about how he views even his own film “Peace” in a different light, in terms of before and after the March 11 disaster. I played Go (a board game) almost every day for four of my high school years and often skipping lunch to play! The rules of Go are easy to learn and the game is enjoyable even for young kids (some as young as 6 years old can pick it up quickly). Despite Go‘s seeming simplicity, I think Go takes longer (or is harder) to master than Chess (more on this later). 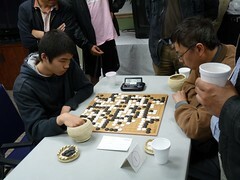 Yesterday (July 2nd), I had the pleasure to visit the Calgary Go Club in Chinatown and attended part of the 2011 CGA Open Go Tournament. Have a watch of the following highlight video. You will also find a series of interviews I conducted with Calgary Go Club Chair Vincent, a Go instructor (Cathy Li), two advanced Go players (Ryan and Jing Yang), and father of the 10 years old advanced Go player Wanshan Gu (Qiang Gu). Note: If and when I receive the official results of the CGA Open 2011 from Calgary Go Club Chair Vincent as promised, I will post it here. 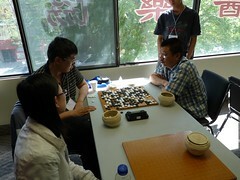 Irene Sha and Bill Lin won the pairs tournament. In 1997, the chess computer Deep Blue won a six-game match against world champion Garry Kasparov. As far as I know, Computer Go is still very far from able to win against even mid-level professionals and let alone Go champions. Have a read of the Wikipedia “Computer Go” page as it is pretty informative.